There is no argument that all asphalt cement (AC) pavements crack. 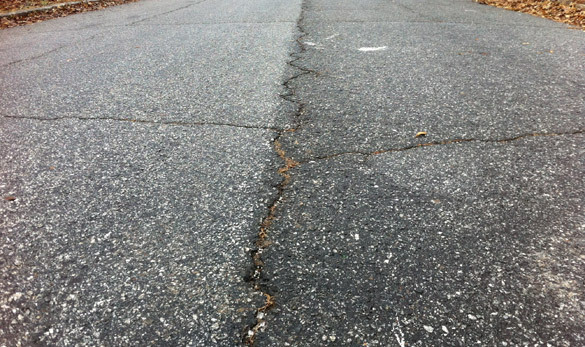 Cracks in asphalt pavements are inevitable. Neglect and lack of proper maintenance lead to accelerated cracking and/or potholing, further reducing the serviceability of the pavement. There are numerous reasons, which can be broadly categorized, in four distinct classes. • Pavement Construction: Examples in this category include flaws in the selection of the right type of asphalt mix, poor mix design, engineering defects, unsuitable ambient conditions, etc. If all of these factors meet design criteria, poor workmanship may be considered as a cause for premature failure of the pavement. • Traffic Frequency & Load: Fatigue cracking and rutting are the two principal considerations in the pavement design process because they are the primary mode of deterioration of asphalt pavements. • Deterioration of the asphalt cement binder, primarily due to weathering under the degrading effects of ultraviolet radiation. • Climatic conditions, and pavement expansion and contractions due to temperature variations, and freeze thaw cycles. Once cracks develop, water easily penetrates into the base and sub-base of the pavement and damages the structural integrity of the aggregate materials. Pavement joint and crack sealants are designed to protect the pavement by minimizing water infiltration and by preventing the accumulation of debris. It has been amply demonstrated and documented that sealing cracks in flexible pavements is a sound preventive maintenance procedure, which adds many years to the life of the pavement, especially when used in conjunction with other preventive techniques such as slurry seal, chip seals and sealcoating. • Crack sealing is an important procedure that must be addressed yearly. 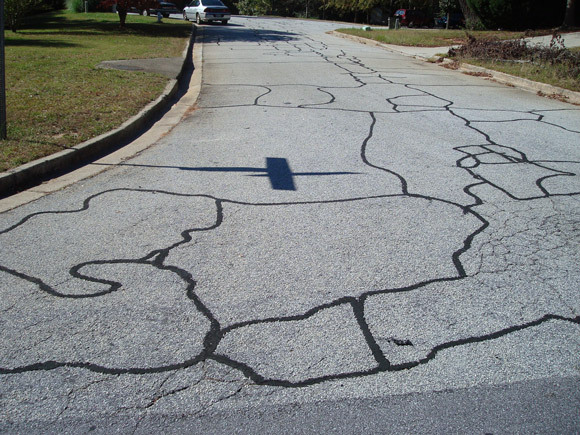 • Crack sealing is one of the most cost-effective ways to prolong the pavement life, as much as 3- 8 years. Life Cycle Cost Analysis (LCCA) is defined in the Transportation Equity Ace for 21st. Century (TEA-21) as “a process for evaluating total economic worth of a usable project segment by analyzing initial costs and discounted future costs, such as maintenance, user costs, reconstruction, rehabilitation, and restoring and resurfacing costs, over the life of the project segment. Crack sealing is highly cost effective and a lot less expensive than other preventive procedures e.g. an overlay which costs 8 to 26 times as much as crack sealing. Furthermore, it was also reported crack sealing slowed the reappearance of reflective cracks in the new surface. Reflective cracks may be considered as secondary cracks which are caused by the problems within the base course and can not be eliminated without addressing the initial cause of the problem. State maintenance departments bear most of the burden of dealing with cracks and out of several options available to them (slurry, chip sealing, overlays, etc. ), they commonly exercise two, crack filling and crack sealing. These operations have been routinely conducted for many years; however; their potential benefits as preventive maintenance tools have only been recognized over the last two decades. Crack sealing - the placement of specialized materials either above or into working cracks using unique configurations to prevent the intrusion of water and other incompressibles into the pavement cracks. Working refers to horizontal and/or vertical crack movements greater than 0.1 in (2.5 mm). Transverse cracks are a good example of working cracks; however, some longitudinal cracks may also meet the movement criterion. Crack sealants are rubberized products that have the ability to seal the crack and flex with the pavement’s movement. They are used for active cracks that continue to extend both in size and severity with time and the ravages of the traffic and weather. Crack sealants have excellent adhesive and cohesive properties. In other words they firmly adhere to the walls of the cracks and do not tear or split when the cracks widen. Again their primary function is to stop the intrusion of water, salts and debris from entering the pavement sub-base and base courses. Crack filling - The placement of materials into non-working cracks to substantially reduce the infiltration of water and to reinforce the adjacent pavement. Non-working refers to horizontal and/or vertical movements less than 0.1 in (2.5 mm). 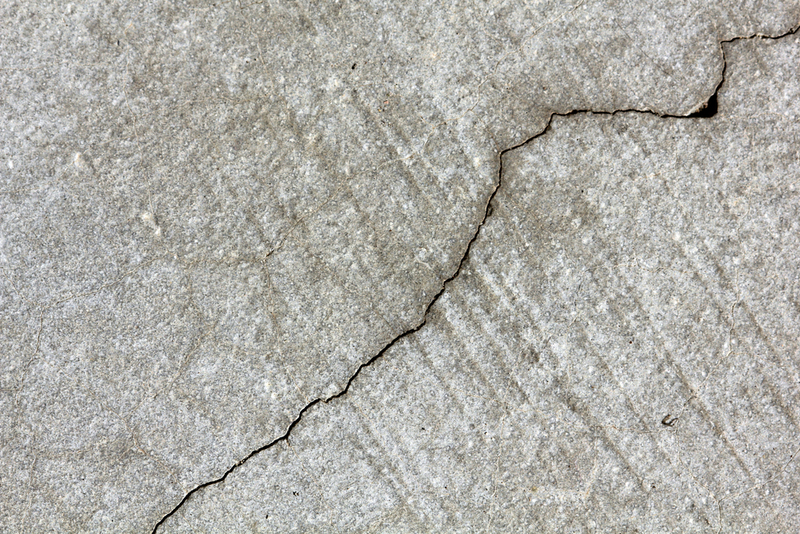 Non-working cracks typically include mostly longitudinal, diagonal cracks and some block cracks. Such cracks do not move much due to the close spacing between the edges. Since there is minimal flexibility expected, the materials used for crack filling are non-rubberized products, e.g. crumb rubber, AC-3, and asphalt emulsion. Crack filling is therefore simply filling the cracks that do not show significant movement. It is easy to conclude that the requirements for crack sealing are more stringent both from material and equipment considerations than crack filling. Crack Seal or Crack Fill - How to Decide? Generally, Transverse cracks are the first ones to appear in a pavement. Several different types of cracks may appear during the same period. Under such conditions, one material meeting the most demanding type crack may be appropriate. For deciding whether to fill or seal cracks, the expected movement of the cracks in the pavement should be carefully considered. Generally, non-working cracks with moderate to no edge deterioration should be filled and the ones with limited edge deterioration are sealed. Experienced personnel can usually identify the crack type; working or non-working and take the appropriate action. The following tabulation is a summary of the foregoing descriptions. > or = to 50% of crack length. 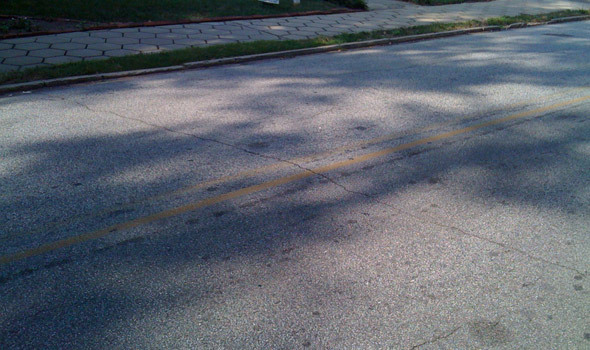 Transverse Cracks extend across the pavement from shoulder to shoulder or shoulder to the centerline at approximately right angles to the pavement centerline or the direction of laydown. They are typically the first cracks to appear and are usually temperature related. They are generally not load- associated. They are caused by the inability of the asphalt layer to redistribute the pavement stresses that occur along the pavement length and width as the temperature decreases. As the asphalt layer gets older and stiffer with age, it loses its ability to redistribute the stresses even more. The cracks then develop at closer and closer spacing. Longitudinal Cracks run the length of the pavement roughly parallel to the centerline or laydown direction. They may be caused by a number of reasons; poorly constructed paving lane joint, shrinkage of the pavement surface (under low temperatures), hardening of the asphalt, daily temperature cycling, etc. Like the transverse cracks, pavements with longitudinal cracks lose their ability to redistribute the stress, which becomes worse with time. Longitudinal cracks appear later than transverse cracks. Edge cracks appear at the joint with concrete curbs. They rapidly widen and deepen with continuous freeze thaw cycles. Seam cracks occur along the paving joints and are typically caused by improper hot mix paving procedures. Block cracks appear in a block or square pattern and are usually spaced between 4 to 12 feet. Block cracks generally appear towards the end of the pavement life but they may appear sooner if the base courses were not of the right thickness, were improperly compacted, or lack proper drainage. Reflective cracks do not show a set pattern, they may be of any configuration. They appear when the surface material cannot adjust to changes in the movement of the sub-surface courses. To eliminate reflective cracks, problems associated with sub-surface courses should be corrected. Alligator or map cracking is a series of interconnecting cracks caused by the fatigue failure of the asphalt surface under repeated traffic loading. Such cracks are extensive, close together and go in all directions. Cracking begins at the bottom of the asphalt surface, where the tensile strength is the highest under a wheel load. Initially the cracks propagate to the surface as a series of longitudinal cracks. After repeated traffic loading, the cracks connect, forming many sided, sharp-edged pieces that develop a pattern resembling chicken wire, alligator skin or a road map. Alligator cracking occurs only in areas subjected to repeated traffic loading, such as wheel paths. Alligator cracking indicates a seriously deteriorated pavement, which can not be saved by cracksealing. Crack sealants are specific to pavement types. Different types of pavement require different materials, depending upon their construction and use. Notwithstanding the lack of mention in the foregoing sections, crack sealing is used extensively for the maintenance of rigid (concrete) pavements. The following specifications and comments are, therefore, categorized under two sub-headings, flexible (asphalt) and rigid (concrete) pavements. ASTM D 3405-97 - Standard specification for Joint sealants, Hot applied, for Concrete and Asphalt Pavements. Equivalent to AASHTO M301 or Federal Spec. SS-S-1401C. ASTM D 5078-95 - Standard specification for Crack-Filler, Hot applied, for Asphalt Concrete and Portland Cement Pavements. FEDERAL SPEC. SS-S-1401C - Sealants, Joint, Non-Jet-fuel Resistant, Hot Applied, for Portland Cement and Asphalt Concrete Pavements. STATE DOT SPECIFICATIONS - Generally modifications of the above specifications. Other types of materials, such as emulsified asphalt, cut-back asphalt, and chemically cured products will continue to be used where the cost or use is justified. ASTM D 1190-97 - Standard specification for Concrete Joint Sealer, Hot-applied, Elastic Type. Equivalent to AASHTO M173 or Federal Spec. SS-S-164. ASTM D 3405-97 - Described in section 1. ASTM D 5078-95 - Described in section 1. ASTM D 5893-96 - Standard Specification for Cold Applied, Single Component, Chemically Curing Silicone Joint Sealant for Portland Cement Concrete pavements. ASTM D 2628-91 - Standard Specification for preformed Polychloroprene Elastomeric Joint Sealant for concrete pavements. ASTM D 3569-96 Standard Specification for Joint Sealant, Hot Applied, Elastomeric., Jet-Fuel Resistant -Type for Portland Cement Concrete pavements. ASTM D 3581-96 Standard Specification for Joint Sealant, Hot Applied, Elastomeric., Jet-Fuel Resistant -Type for Portland Cement Concrete pavements and Tar-Concrete pavements. Federal Specification SS-S-1614A Sealants, Joint, Jet-fuel Resistant, Hot Applied, for Portland Cement and Tar Concrete Pavements. Resistant to fuel and heat generated by aircraft exhaust. Federal Specification SS-S-200 - Sealants, Joint, Two-component, Jet-Blast Resistant, Cold Applied, for Portland Cement Concrete Pavements. The benefits of joint sealing in airfield pavements have not been thoroughly proven. However, risk of damage to aircraft engines by foreign objects (e.g. spalled asphalt) is recognized. Crack sealing, therefore provides insurance against expensive damage to aircraft engines. 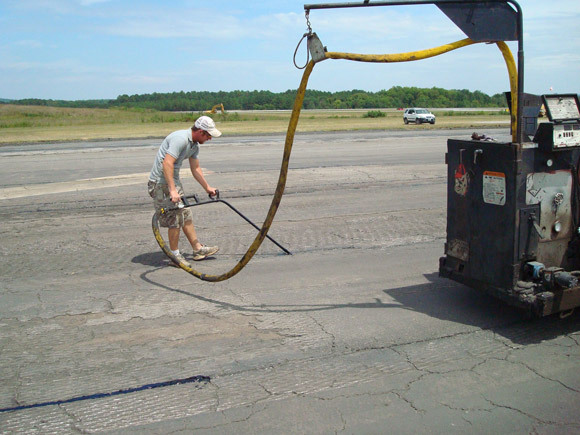 Crack sealing is a highly cost effective maintenance procedure for both flexible (asphalt cement) or rigid (Portland Cement Concrete) based pavements. 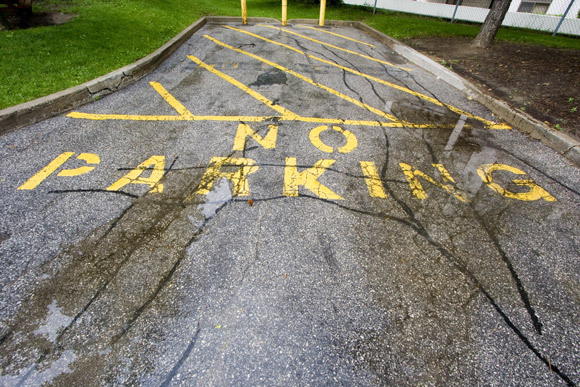 Most states in the U.S. use crack sealing and filling as a part of their standard pavement maintenance program. It is imperative that the maintenance personnel understand the difference between crack filling and crack sealing, use the specified product and apply according to detailed product recommendations. Crack sealants are engineered products, specific to the pavement construction, traffic volume, loads and ambient conditions. Majority of the crack fillers is based on asphalt cement, and modified with polymers or other specially chemicals/ fillers. Some specialty crack sealants are based on silicone or multiple components curing chemicals. The performance requirements are detailed under ASTM, Federal Specification, or state specifications. The DOT’s are an excellent guide to the type of the products that shall be chosen for a specific job within the geographical region, to achieve the optimum performance.